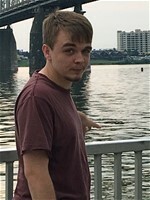 Logan Alexander-Riley Goodman, 23, of Elizabethtown, died Wednesday April 3, 2019 at his home. He was a native of Hardin County, was a 2014 graduate of Central Hardin High School, and worked for Amaray as a fork lift driver. He was an avid video game player and liked to drag race at US 60 in Hardinsburg. He loved his dogs, Daxter, Chief, and Jazzy, and his cat, Sassy. He was preceded in death by his grandmother, Joe Ann Riley; and great grandfather, Bobby Peters. He is survived by his parents, Tim and Denise Goodman; three brothers, Jeremy, Trent, and Brandon Goodman; his niece and nephews, Alyssa, Collin "Woo Woo", and Aiden; grandmother, Barbara Willyard; grandfather, Whayne Riley; great grandmother, Ruby Peters; his best friend, Logan Crutcher; and numerous aunts, uncles, and cousins. A memorial service will be at 4 p.m. Sunday at Brown Funeral Home. Visitation will begin at 1 p.m. Sunday at the funeral home. Condolences may be expressed online at www.brownfuneral.com.